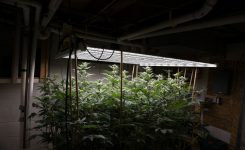 There are many options out there for marijuana grow lights, but what’s the difference? 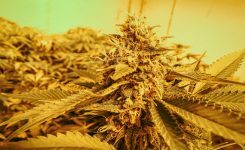 We are outlining the pros and cons for HPS, LED, and CMH lights to help you better decide what light is best for your growing needs and in your budget. High Pressure Sodium, or HPS, grow lights are often used during the flowering stage. High Pressure Sodium lights are very efficient, and their yellow light stimulates bud production. Using HPS grow lights during the flowering stage produces better yields per watt of electricity than any other type of grow light available today! The effectiveness of HPS lights make them quite popular. 10-15% more efficient than metal halide bulbs. Less costly when it comes to output per wattage. The most efficient HID, and the best for the flowering stage (When using HPS grow lights in the flowering stage, you can expect about 0.5-1 gram/watt if all goes well). The bulbs trigger plant hormones to be released and plants to start budding by releasing wavelengths of light in the orange and reddish spectrums along with the change in light cycle. They are readily available in kits with everything you need. 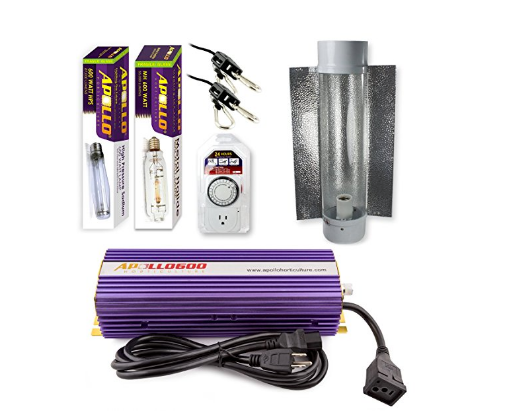 HPS lights 600W+ produce immense heat. As a result, , you will incur extra expenses such as running fans and purchasing equipment for an exhaust. They are more prone to break than any other type of lights; expect to replace them every three to four grows. HPS lights cannot be plugged into a regular light socket because they need a special hood and ballast. As such, they are extremely power hungry, and can significantly increase electricity bills. This budget friendly light is lightweight, energy efficient, and versatile. Comes with a 150 watt HPS bulb, but has the flexibility to operate different bulb wattages, enabling you to choose between 250 and 400 watt bulbs as well. Additionally, can be supplemented with CFL’s for larger grows. Great for a small grow room of 1-2 plants, especially for your Veg Room. Recommended to cover up to a 3’ x 3’ growing area. The ballast is built into the reflector, so it can get hot and may need extra ventilation, especially for an enclosed grow room/tent (adding a fan should do the trick). To conclude, it’s a great value product, uses little power, is very quiet, and a smart buy for a small space. Great quality product which makes for a decent starting point for a new grower or budget conscious gardener. Comes with 1-MH bulb (for veg), 1-HPS bulb (for flowering), electronic cooling fan ballast (comes with a 3-yr warranty! ), hangers, and a light timer. Recommended for a 4’ x 4’ growing area, with proper ventilation to avoid overheating your garden. 600W produces most lumens per watt, so this light will be very cost effective. It also gives you the ability to adjust the light power to 50%, 75%, and 100%. Quieter ballast than similar products in its price range. Overall, this piece has a solid build, it’s incredibly bright, and it’s easy to hang and mount the ballast. Widely considered as the best lamp on the market. Great for a larger tent or a small room, with up to a 5’ x 5’ growing area. 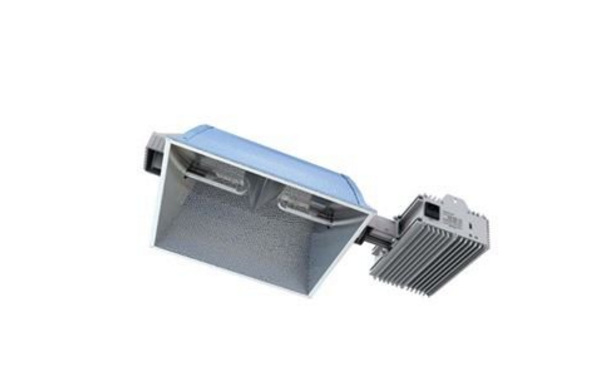 Allows for less electricity cost and less heat output than a traditional 1000 watt light. Can be used with a Gavita controller to manage multiple lights for a larger scale grow. 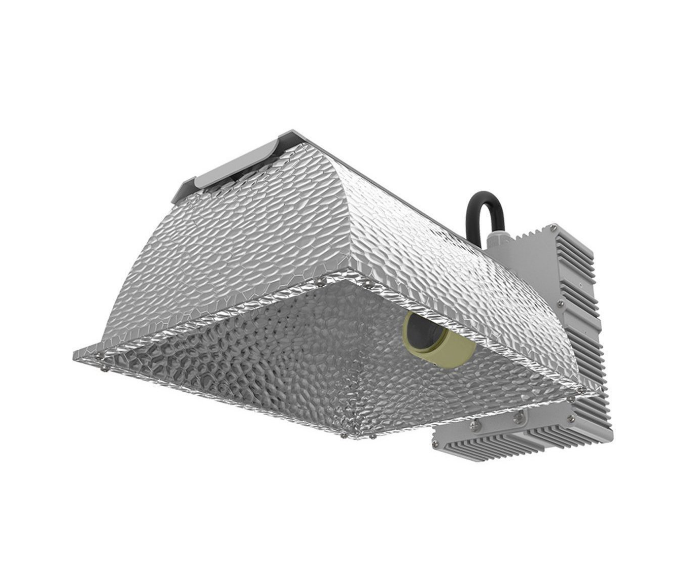 Overall, this sustainable and larger scale light has people raving about its brightness, huge footprint, and amazing yields for their plants. For growers who are looking to harvest ½ half to one ounce of cannabis each month, LEDs may be your best choice. At this size, LEDs are energy efficient, run cool, and need little to almost no setup! They get better yields than fluorescents, but don’t run as hot as an HPS of similar wattage. Note: When shopping for LEDs, make sure they contain some amount of green or white (full spectrum) light. If you see an LED lamp that only has diodes for red and blue light (which was very common in older models), don’t get it! 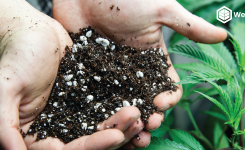 Plants grown without at least a tiny amount of green or white light are very prone to nutrient deficiencies and simply don’t grow as efficiently. With no heat output, it is easier to deal with, and you don’t need to purchase extra equipment for ventilation/cooling. Have built-in cooling that pushes heat up and away from the plants. It is an easy set up, as the smaller sized LEDs simply need to be plugged into the wall and hung up over your plant. 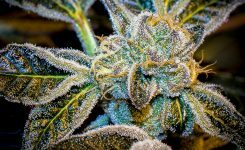 Some growers believe LEDs produce more resinous bud. Combining LEDs with HPS grow lights has produced great results for some growers, though more testing is needed. On average, LEDs get slightly smaller yields per watt than HPS grow lights, . commonly yielding about 0.5g/watt. There is a learning curve to getting the best yields from your LEDs, because each lamp is different and there are no “standards” to go by yet. A little experience with a specific lamp can improve your yields significantly! 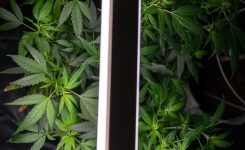 LED grow lights tend to require a lot of space between the lamp and your plants, which means you need a tall grow space to get the best results. Smaller LED panels should be kept 18″ or more away during the second half of the flowering stage to avoid light burning your buds, even if the grow room is cool. Although the LED lamp itself runs cooler than a similar wattage HPS bulb, it still produces heat. The bigger sized LEDs, like 300W+, may need to be vented with an exhaust fan to prevent the grow space from getting too warm. They run cooler than CFLs, saving money, are built with a light solid construction, have great light output, and a good cooling system. Features both “Veg” and “Bloom” automatic settings for your garden, providing your plants everything they need throughout their life cycle. Core coverage is about 2.5’ x 2.5’ft with a 24” distance above the plants. Max coverage can run up to 3.5’ x 3.5’ft. Some people are praising its reliability and longevity (3+ years of use!). This light is definitely a favorite among growers. They offer a great affordable price for such quality lights, as they are adequate for both beginners and advanced gardeners. Offers high-power performances, with increased energy efficiency (60% energy savings, compared to fluorescent and HID) and an extremely low heat index, keeping your cooling costs down! 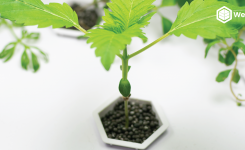 Light-weight, flexible, easily movable/removable, able to be used for various horticultural applications and fits in many different growing environments. Ships with flush mountable hardware clips for effortless mounting. 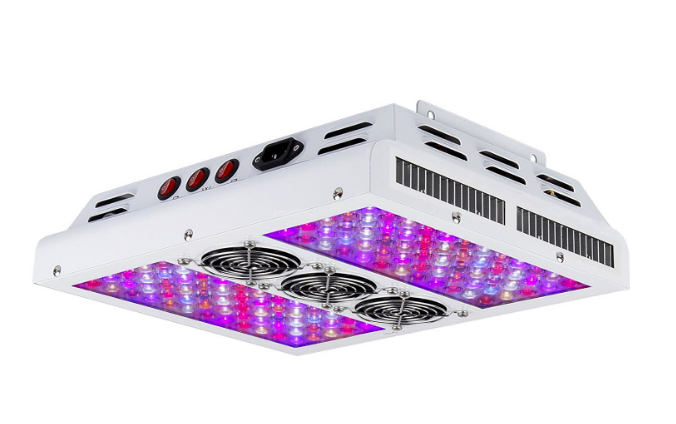 85% more PAR light per watt compared to other grow lights, 3 Year Limited Warranty. A great replacement for 328W 6 Bay High Output T5. 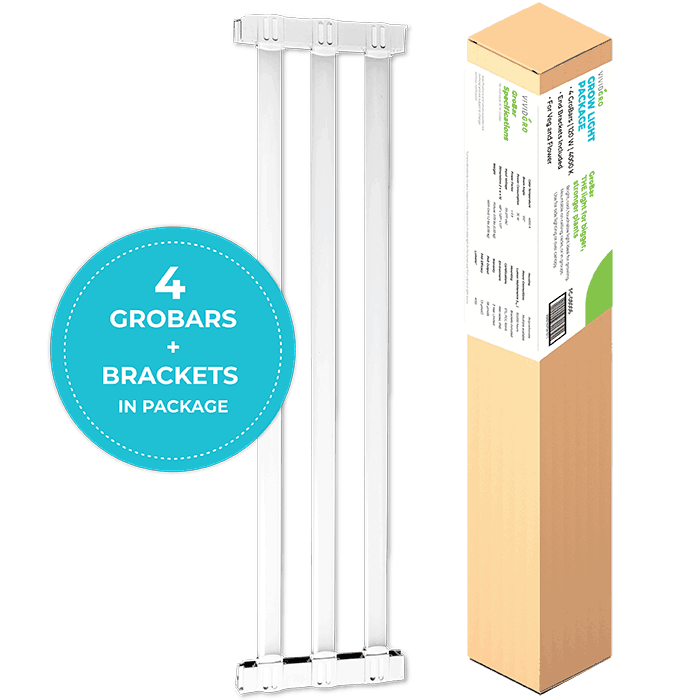 This package includes 4 GroBars plus brackets. For optimal results, decreased costs, and low energy/heat output, look no further than the VividGro GroBar! A valuable feature of this LED is its optimal full spectrum, which is ideal for all kinds of indoor plants at all growth stages. It’s the perfect size for a smaller space, giving you the flexibility of adjustable lights and spectrum, while running cooler than HPS lights (can range ~70%) and making very little noise. The footprint on a canopy is best around 2.5’ x 2.5’ at 18” above canopy. It is also recommended that two lights would be best for a bigger tent, around ~2’ x 4’. While this light is comparable to other similar products, like a traditional 600W HPS, it averages around the same lux meter and uses less than half the wattage. This mega light comes with a pair of light hangers and some grow room glasses. The manufacturer goes as far as stating that these lights have the largest footprint of any LED in the industry, measuring 23”x17”x3.5” with a 4’x4’ footprint — matching that of its HPS counterpart, the 750w HPS. Additionally, it consumes around half the electricity and produces a fraction of the heat of that of an HPS/MH light. 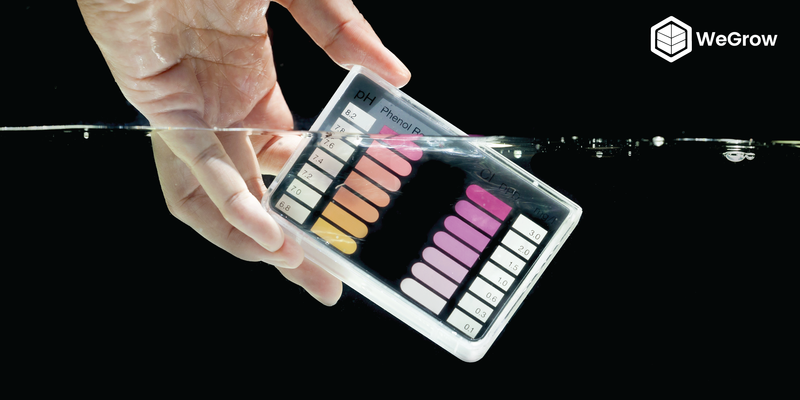 Each of the three primary ranges of the photosynthetic spectrum can be adjusted individually to give plants the ideal spectral ratios from seed to harvest. 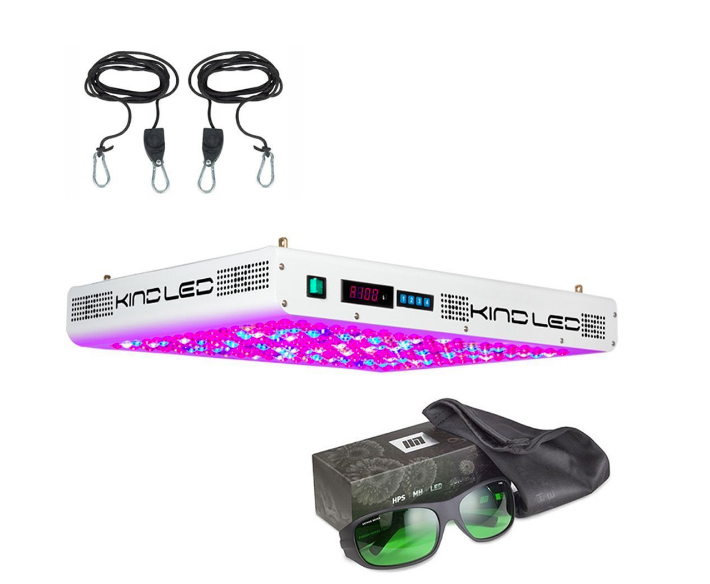 This lights are highly recommended, both in quality and yield, and most importantly, they tend to run quieter and more efficiently than other grow lights. The Kind K5 may come with a hefty price, but customers are blown away by the quality and quantity of their results. Ceramic Metal Halide (CMH) & Light Emitting Ceramic (LEC) Grow Lights are two names for the same thing. These ceramic metal halide bulbs use ceramic as part of the lamp, similar to high pressure sodium bulbs. As a result, CMH bulbs are more efficient than regular MH lights. Less energy use than HPS, but same amount of light. Great spectrum for both flowering and veg. CMH bulbs last longer and keep their brightness for longer than regular MH grow lights, so bulbs don’t need to be replaced as often. Many CMH grow light models come with a built-in ballast, which makes them “plug-and-play” (you plug the light directly into the wall) like an LED, as opposed to most HPS grow lights, which need a separate ballast. CMH lights produce UV-B rays, like the sun. This may contribute to increased trichome development and smell in cannabis buds grown under LECs. However, UV-B rays get blocked by glass, so there needs to be a clear path between the plant and the light for this to be effective. CMH grow lights have a pretty high cost, starting around $500 for the smallest size. Unfortunately, LEC grow lights don’t quite get the same yields as HPS grow lights of similar wattage. 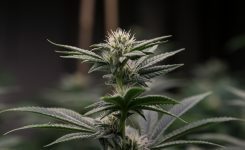 However, they do get significantly higher yields than a similar wattage Metal Halide bulb would get in the flowering stage, but with all the added benefits stated in this article! 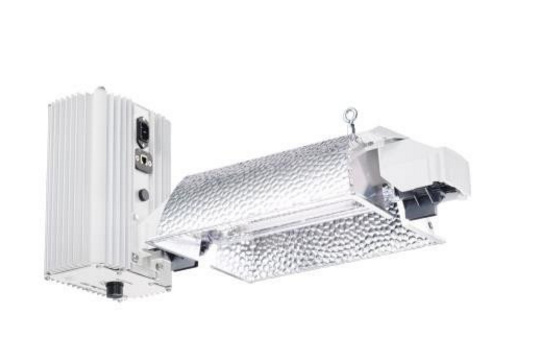 This 315 CMH Grow Light fixture can operate on 120/240V (and comes with an adapter), a pair of hangers for convenience, and the aluminum ballast is extremely reflective – perfect for a 4×4 grow. Our only recommendation is to give it some ventilation, as it is prone to generate some heat. Overall, this light is a great buy if you want something that is constructed with quality, runs quietly, and is at an affordable price point. The Nanolux CMH 630W Lamp fixture is designed and optimized to give a balanced footprint, making it a great option for larger grow rooms. It has a low frequency ballast, which is side mounted and primarily made for lower temperature environments, so be sure to have some good airflow. With a broader light spectrum than HPS and MH lamps, it is more similar to the sun, easily replacing 1000w HPS. 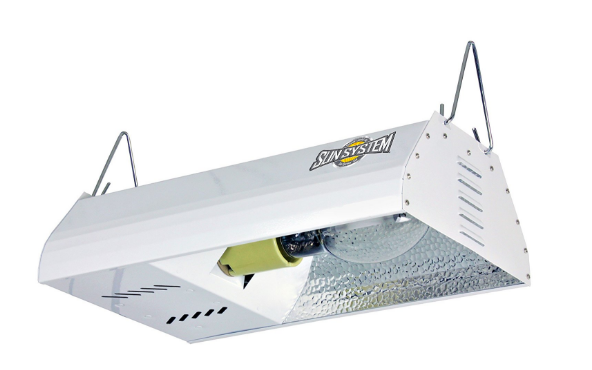 While it needs two functioning bulbs to work properly, this diverse fixture can be used as a primary veg light, a primary light for SOG applications, or a supplemental full spectrum light for large flowering operations. Runs at a lower power and lower heat, running cooler than an HPS. 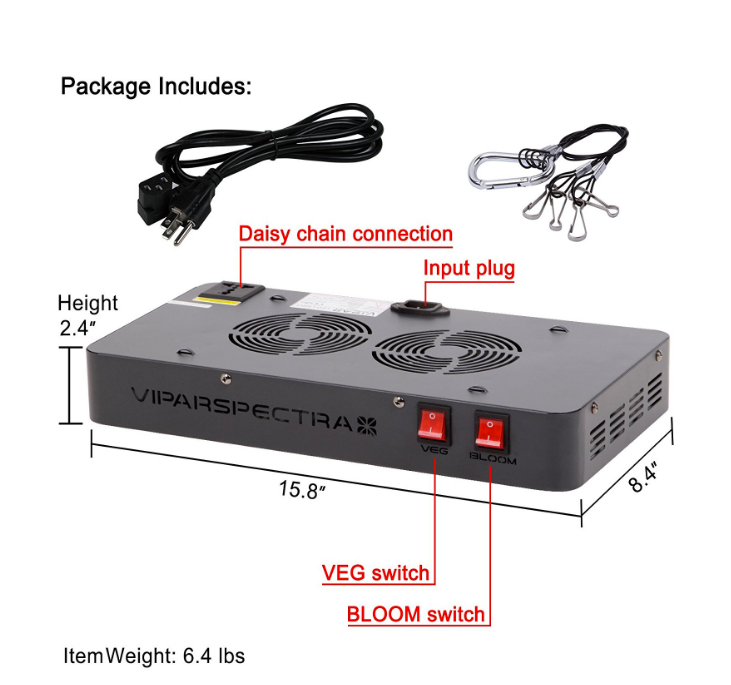 Provides an improved full color light spectrum for both flowering and vegetative stages of your grow. Great size for a 4×4 tent, although some growers recommend supplemental lighting (like LED strips) to fill bigger spaces and to keep them around 12-18” above the canopy. 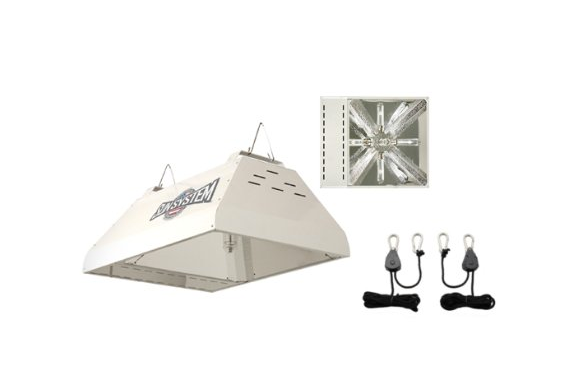 Overall, the Sun System LEC 315 is a great higher-end CMH fixture for your growing needs, combining the best of both worlds with reduced heat and power levels! Great article on lights I went straight to LED a Noah 4S an just making up a proper ventilation kit as was a bit bush the setup I had . Great was info on hps an misinformation I had so keep it up as we way behind everything here in New Zealand . Enjoy day folks I got tent to put up .